Berwick Rangers Under-20s returned to the top of the table with a 2-1 victory over Forfar Athletic. Two of the goals came early on, the third came out of the blue and Rangers were compelled to play the final 20 minutes with 10 men. Local player Kieran Ingram was missing from Rangers’ line up because of a groin injury. Ewan Herriot, home man of the match, moved infield to start alongside Lewis Swaney at the heart of the defence. The Scott twins were on the bench. A second-minute Berwick corner posed no threat but the ball was returned their way. It was duly sent back into a crowded Forfar penalty area setting up a scrummage in which a number of players from each side got a touch. Eventually, Daniel Watt passed along to Swaney, upfield for the initial corner, who scored his first goal for the club. Forfar levelled in the eighth minute. Home goalie Grant Goodfellow scooped away the ball following a free-kick from the right but it fell to Matthew Aitken, who hit it hard and low into the net. With a long through ball from Herriot and Jamie Henderson’s edge in pace, a second Berwick goal seemed a distinct possibility, but good goalkeeping from Jack Shaw prevented Henderson from even attempting a shot. In the opposite box, Forfar’s Connor Samson was away on his own until undone by Herriot’s sliding tackle. Rangers again looked vulnerable when the corner came over but Goodfellow managed to punch it away. Some aimless passing was symptomatic of Berwick’s struggle for fluency, though three minutes from the break, they knitted together a snappy three-man move after Watt stole the ball. It ended with Sam Jones curving it wide. Five minutes into the second half, nothing appeared on when Jamie Chapman took possession in midfield and stepped a few yards inside. Now directly in front of goal but almost 40 yards out, the ball was in the back of the net before home defenders had time to blink. It proved a mixed night for Chapman, upset by his 69th-minute straight red for a challenge on James Yates. Forfar wasted no time in seeking to take advantage, attempting to draw home players into premature tackles in order to make the extra man count. Wide right player Jamie Gill, whom Berwick were struggling to cover, also received plenty of ball. Fresh legs were introduced with a double substitution 14 minutes from time. Apart from the two earlier saves, Goodfellow had not had a lot to do but now found himself fully occupied. Luck was with him when Aitken’s shot bounced down from the underside of the bar. The same player headed the rebound towards goal but it was hooked off the line. Samson fired over the intersection and, as frustration crept in, clubmate Gill was booked for dissent joining Rangers Barry Hogg, Swaney and Ally McDonald on yellow cards. 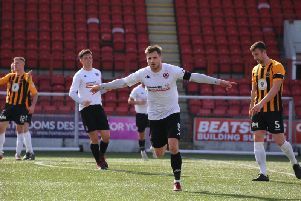 Manager John Coughlin agreed it had been a scrappy game, a view tempered by pleasure at seeing Berwick back in pole position on the competition ladder.